Thirty-five years ago, Alex Johnstone, a professor and teacher of chemistry at the University of Glasgow, published a short paper on why students found chemistry hard to understand. He postulated that experts in chemistry viewed any subject topic at three levels, and “jumped freely from level to level in a series of mental gymnastics”, whereas, students did not engage in such “multi-level thought”. He used his knowledge of chemistry, and findings from information-processing studies to describe three ‘levels’ of chemical knowledge — the macroscopic or descriptive (embodying the physical characteristics of a substance such as density, color, etc. ), the molecular or submicroscopic (explaining the chemical properties of the substance), and the symbolic or representational (formulae and equations). He devised a representational triangle known as the ‘chemical knowledge triplet’ which is highly influential in the field of chemistry education. The utility of the Johnstone’s triangle framework is not restricted to chemistry alone. A recent paper by Wright et al. 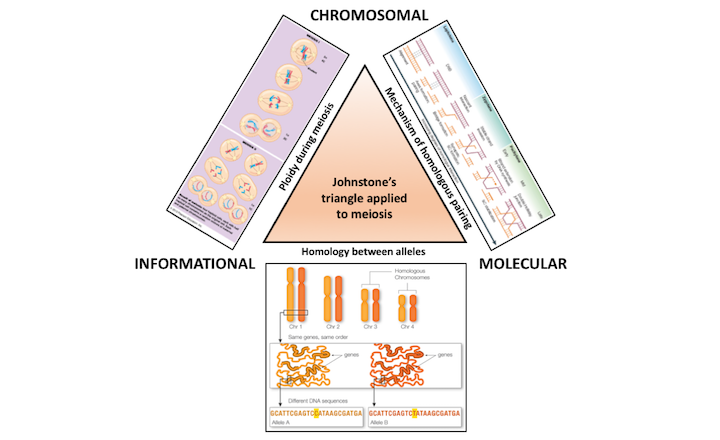 from the Rochester Institute of Technology adapts Johnstone’s triangle to address a question in biology education: why do students have trouble understanding the process of meiosis? Meiosis is a cell division process in which the daughter cells formed after division have one copy of the chromosomes carried by the parent cell. The process is essential for all eukaryotic organisms that undergo sexual reproduction and is central to the formation of gametes. The process of meiosis is undoubtedly complex; however, a thorough understanding and comprehension of meiosis is essential for the students of biology. Unfortunately, despite repeated lessons on meiosis during the course of undergraduate study, Wright’s team discovered that many students, even third-year biology majors, had a poor comprehension of the subject. Drawing from a large dataset of assessment responses, interviews, and classroom experiences, Wright’s group postulated that students face trouble in connecting knowledge of DNA between three levels — chromosomal structure of DNA (sizes and shapes of chromosomes), molecular structure of DNA (relating to the sequence of nucleotide bases in DNA), and at the informational level (an abstract understanding that DNA sequences contain information in the form of genes). The study also found that the standard text books used in the classrooms also failed to connect the three levels in explaining these concepts. The team has shown in a previous publication that although students possess the knowledge of chromosomal and molecular levels of DNA structure, they focus mainly on the former to explain the beginning and the end of meiosis. This inattention to the events occurring at the molecular structure of DNA (such as the process of complementary pairing and crossing over) leads to a lacuna in their understanding of chromosome behavior and the outcomes of meiosis on an informational level; for example, many lack the ability to articulate the phenomenon of allele segregation in the context of meiosis. Wright and her team term the framework of these three levels ‘the DNA triangle’, and show that it is a generalizable model useful for teaching various concepts in meiosis, and for other processes involving DNA. In the course of gathering data to illustrate the usefulness of the triangle, the group identified three themes in meiosis that seemed to generate a lot of confusion among students — homology, homologous pairing, and ploidy. When questioned, experts and students had vastly different comprehensions of these three concepts. Students thought of chromosome homology in purely physical terms — homologous chromosomes had “the same size and shape”. While experts defined homologous chromosomes on an informational level as well, carrying the same genes in the same order, but alleles differing from each other by as little as a single base. Homologous pairing and crossing over were defined by experts at both informational and molecular levels — that pairing occurs due to high sequence similarity between homologous chromosomes, and that crossing over occurs between complementary DNA strands to swap information through a physical connection. However, students believed that crossing over involved the exchange of chunks of sister chromatids exchanging places. Experts defined ploidy at informational and molecular levels as the presence of two sets of information for each ‘type’ of chromosome, one maternal and the other paternal, in a typical diploid cell. Students, though, defined ploidy simply on the basis of chromosome set — replicated two-DNA chromosomes were considered diploid, while unreplicated one-DNA chromosomes were haploid. Based on their study, the authors suggest that effort needs to be made to introduce molecular-level details in explaining meiosis to undergraduate students. They put forward the idea to have interactive sessions where students become chromosomes by using long paper strips printed with DNA sequences as visual and physical aids. By comparing base sequences on their strips to find their homologous pair, physically aligning the strips and crossing over complementary bases on sister chromatids, students gain a better understanding of these concepts of homology.